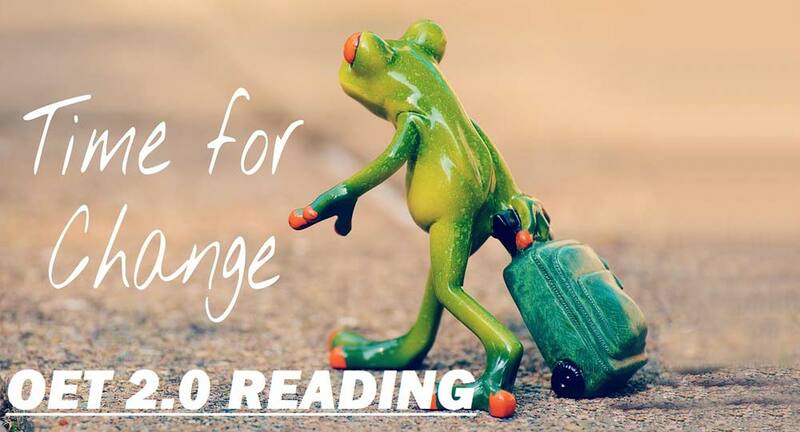 Complete OET 2.0 Reading Part A FAST with Our Amazing 4-Steps Method! The changes to the OET exam format in September of the last year have affected some sections of the test more than others and the reading subset has arguably seen the most changes. Its crucial that you spend some time learning about how the new reading materials are structured, using the new samples to practice and finding out what is expected from the candidates. As you will be aware, the reading test is now split into 3 parts: part A, part B and part C. In this article, we will give you all the information you need about part A so that you are prepared when the exam comes or, even better, before you start using your practice tests. We have created a method which follows 4 basic steps and includes all the tips you need for success. 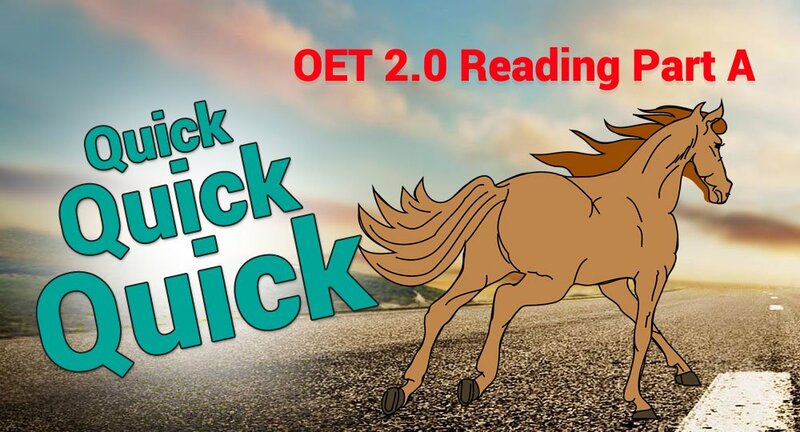 What can I expect from the OET 2.0 reading part A? Reading part A is the first section of the reading exam. It consists of 4 short texts (texts A-D) which will all be related to one theme or topic in the medical field. Remember, they will all be different types of texts; for example, a work-place information guide, a case-study, a short extract from a research paper or statistics. The texts will be accessible for all medical professionals including doctors and nurses. There will be 20 questions to answer about the 4 texts. You will have 15 minutes to answer the questions. The questions are in 3 formats: matching paragraphs, short answer questions and gap fill. As the term suggests, the first set of questions (generally 7) require you to match a statement with a text, identifying which text the information in the statement comes from. For the short answer questions, you will be given a statement taken from one of the texts with a gap for you to fill in. In case of gap fill question type, you will need to complete the sentence by finding the word (or number) in the text that fits in the gap. You will be given up to 8 matching paragraph questions and the rest will be the gap fill questions. 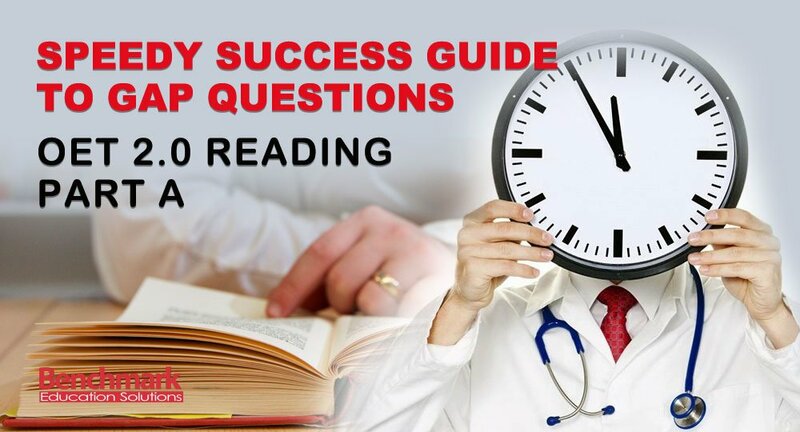 As you would imagine from a task with 20 questions to complete in 15 minutes, you are being assessed on your ability to find and understand information quickly, in the same way that you would need to do in a professional setting. You do not need to develop an in depth understanding of each text or even to read and comprehend every word, rather to locate specific information at a fast pace. Bearing this in mind, we have put together some top tips about how to approach the paper. Here we go! This may sound obvious but if you miss this step and start reading then you will need to figure out the topic from the texts. This is unnecessary as the topic is clearly given to you as a title before all of the texts, directly underneath the instructions section. Now you know what you will be reading about so you will be ready to soak up the information without any confusion! A quick glance at the texts to identify which type of text each one is will help you when you come to reading the questions. It will be quite easy to identify the text-type (in general) from the format. For example; Is the extract a table of statistics or a research abstract? If it helps you, you could jot this information down but remember, we are talking seconds not minutes for this step so if you can keep this in your mind then that’s great. Spend a couple of minutes running your eyes over the texts. At this stage, you are not reading the whole text but looking at the headings, subheadings, opening sentences and keywords that stand out to give you a general picture of the extracts. This way, when you come to answering the questions, your brain will know where to go to find the information more easily, saving you time in the long run. Now that you have done all your preparation work, which should have taken no more than a few minutes maximum, you are ready to begin. Because you now know the topic, text type, general information and some keywords for each text, you will be able to scan the texts and find the information. This means that you do not have to read all of the words in the text (which is lucky because you won’t have time!). As you read the question, focus on what the keywords are in the question. This will probably already lead you to one of the texts. For example, if the question or statement is about figures and statistics and you already know that text B is about statistics, that’s where your eyes will go. Phew! Before you know it, you will have whizzed through the 20 questions with a few minutes to spare. You can spend any extra time going back to any questions that you left out or were unsure of. Following these steps allows you to work calmly and efficiently to beat the clock and no time is wasted which is essential in the reading part A. A good start to the reading subtest will give you more confidence for parts B and C. Now is the time to start practicing with Benchmark OET 2.0 Reading tests. 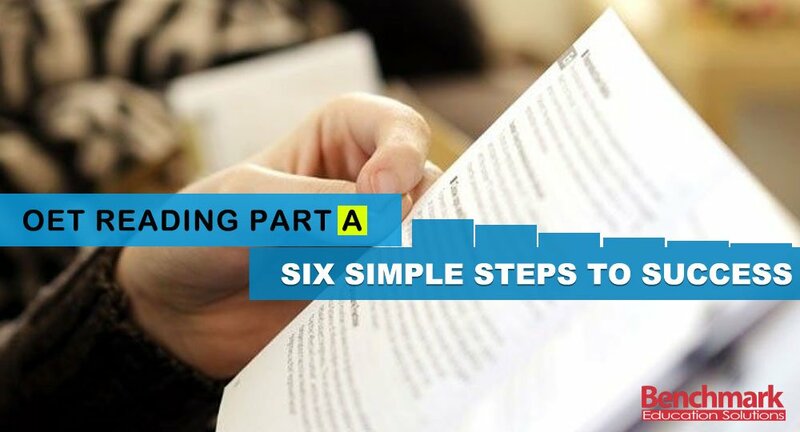 Many people find part A the easiest section of the reading paper, so if you can get used to using the 4-steps method with its helpful tips and become confident in this section, it is a great way to pick up easy marks towards your overall score. Practice this method as many times as possible using samples and practice papers and when it comes to the exam, reading part A will be a breeze. Good luck!